Forest is constantly dedicated to get our products known with the most important stakeholders that are part of the Decision Making Unit for drapery hardware. These contacts are also important for our customer base and Forest is supporting them with special marketing tools. An architect info binder is available with all the brochures and small samples of the different tracks. A handy and convenient tool to explore The World Behind Your Curtains; all product brochures, installation manuals and lots more available on your mobile device, wherever you are. The app is available in the App Store and Google Play; search for Forest Doc. Forest Group also offers a complete range of roller blinds fabrics, suitable for all roller blind applications. 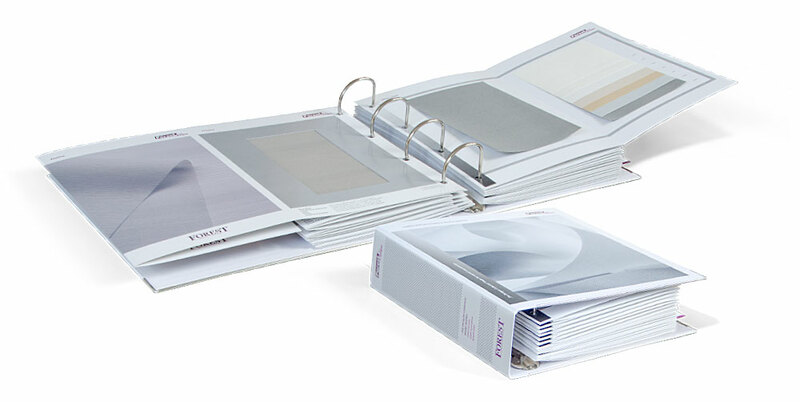 The Eclipse Designer Collection book is the ultimate guide through our roller blind fabrics. See, feel and experience our high quality fabrics. The importance of marketing support is well understood by Forest. Not only international trade shows are participated at, also advertising and articles in the most important magazines of the hotel and interiors industry are part of the marketing strategy. For our customers we have professional support material available to market the systems in the best possible way. Wall displays, table displays and working samples of motorized samples are part of the offerings.